At the Whitman Coin & Collectibles Philadelphia Expo, September 19-21, 2013, you’ll see more coins than a bandit on the old Silk Road. We’re talking U.S. coins, World coins, even ancient coins found along the Silk Road. Not to mention paper money, medals, tokens and other interesting and historic exonumia—all from 1,000 independent dealers. When the show gets underway you’ll find exactly that, and more. And here’s the really amazing thing: it’s absolutely FREE to attend. You can even take part in the official auction by Stack’s Bowers Galleries, including selections from the John J. Ford Jr Collection XXIV of Numismatic American History. Dealer setup will take place on Thursday, September 19 from 8 a.m. until noon. Early Birds will be admitted at 10 a.m. on Thursday and 9 a.m. all other days. The Expo will open to the public at noon on Thursday and at 10 a.m. on Friday and Saturday. Don’t miss “American Silver Eagles: Behind the Scenes at the U.S. Mint” at 1 p.m., Saturday, September 21 in room 309. John Mercanti produced more coin and medal designs than any other employee in Mint history. Join him as he shares a personal behind-the-scenes look at the Mint, and describes how the American Silver Eagle moved our coinage from traditional engraving into the digital era. Immediately following the presentation, Mercanti will be available at the Whitman Publishing booth to autograph his book. 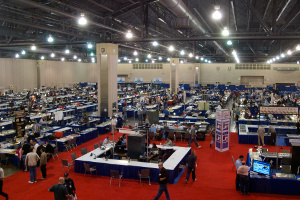 Several organizations within the numismatic community will have booths, give presentations, and hold their club meetings at the Expo. Among them is a Liberty Seated Collectors Club and Barber Coin Collectors’ Society joint meeting. “Collecting the State Copper Coinage of 1785-1788,” with Ray Williams, is an example of what to expect in way of presentations. The Numismatic Guaranty Corporation is conducting its Introduction to Grading class 9 a.m.-4 p.m., Saturday, September 21. The class instructor is NGC grader John Schuch II. Advance registration is required for the class. For more information, call 1-800-642-2646. So, avoid the risks associated with time travel and banditry. Join us for the Whitman Philadelphia Expo, September 19-21in Hall C. Bring the family while you’re at it. Just visit Expo.Whitman.com for details, schedules, and FREE online registration.